Robin van Persie's return to the Emirates hogged most of the headlines of last April's meeting between Arsenal and Manchester United, where Arsène Wenger's men offered a guard of honor to the new champions. Even though Manchester United's newfound linchpin ended up scoring a goal, it was Arsenal's goal that showed some of the frailties in Sir Alex Ferguson's team - which leads up to a sub-question: is the midfield pairing of Michael Carrick/Phil Jones enough to bring United the victories they crave, especially in the European stage? Let us then break Arsenal's goal down and see what Manchester United did and didn't do. In this picture, the ball gets to Van Persie after Manchester United had just won it back. 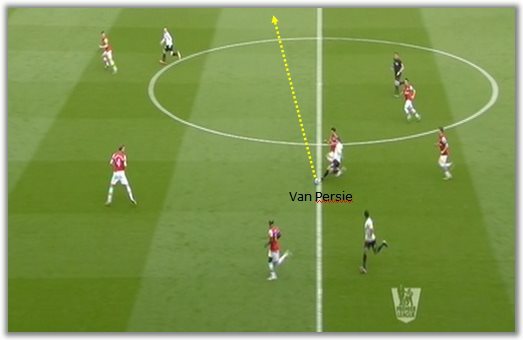 Van Persie almost immediately tries to get the ball to the other side, but the pass goes astray (kids everywhere, this is why your coach is always insisting that you do not try this sort of pass) and eventually arrives at the feet of Arsenal left-back Kieran Gibbs. Gibbs delivers the ball to his team's chief orchestrator, Santi Cazorla, so that the Spaniard can initiate the attack. While Van Persie picks himself up, there is no one around Cazorla, Arteta or Ramsay. Cazorla has all the time in the world to pick his pass. Both Phil Jones (red) and Michael Carrick (orange) have their eyes on the ball - Carrick having Ramsay on his radar -, apparently oblivious to Rosicky. 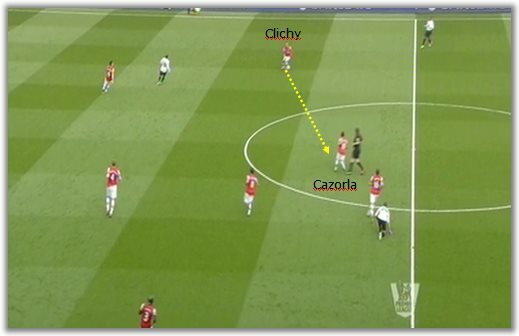 Cazorla's simple vertical pass immediately bypasses Manchester United shield comprised of Carrick and Jones. Podolski, somewhat similarly to Higuaín, drifts away from his markers unchecked to get the ball, which means that, in Rosicky and Podolski, Arsenal now have two unmarked players in between the lines. Patrice Evra was for the better part of the last decade one of the finest left-backs in the world, if not the best. However, he is no longer able to command the touch line as he once did and - to add insult to injury - his defensive abilities seem to be deserting him as well. In this particular case, notice on one hand how Evra is far away from the action. 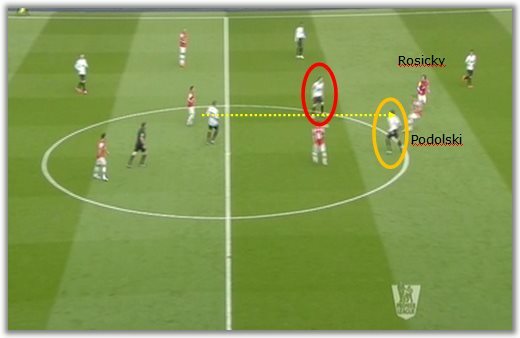 On the other, notice how Podolski and Rosicky are allowed to wander between Manchester United lines. Not surprisingly, that's the space from where Rosicky will provide his assistance. 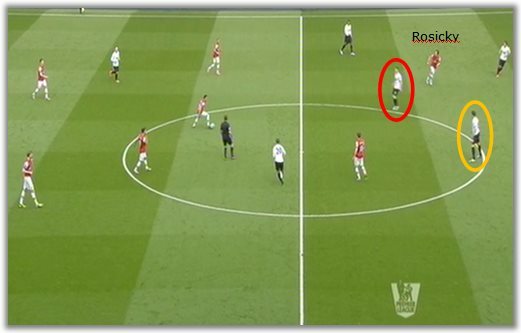 Assuming Evra was on a man-marking job (hard to envision), he still did a shoddy job of it. He looks distracted by what is happening in the centre of the pitch and not paying enough attention to Walcott. As your abilities start declining with age, game-reading skills become ever more important - one of the reasons why Giggs, Beckham or Zanetti are still able to play the game. In his case, Evra seems to rely excessively on his speed and recovering ability, which has left him wanting in numerous occasions before. 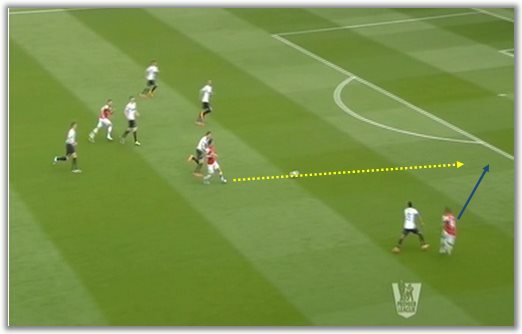 Here, he neither closes the space between him and Evans nor does he mark Walcott convincingly. 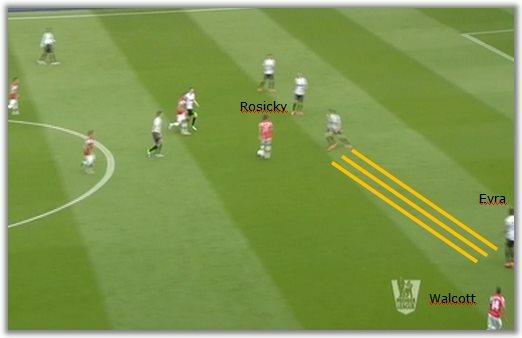 With that much space in the centre and facing forward, Rosicky only had to wait for Evans to commit to him and spray the through ball for Walcott to run on to. As stated earlier, Evra is poorly positioned and his stance does not help either, which means Walcott's speed will only be harder to stop. Afforded acres of space, Walcott capitalised on his speed and managed to beat David de Gea with a well-placed low shot. Despite being the man marking him directly, alienated from the game, Evra is not even the first one to arrive at the "scene." In case the breakdown was too confusing, take a look at the play and see for yourself.